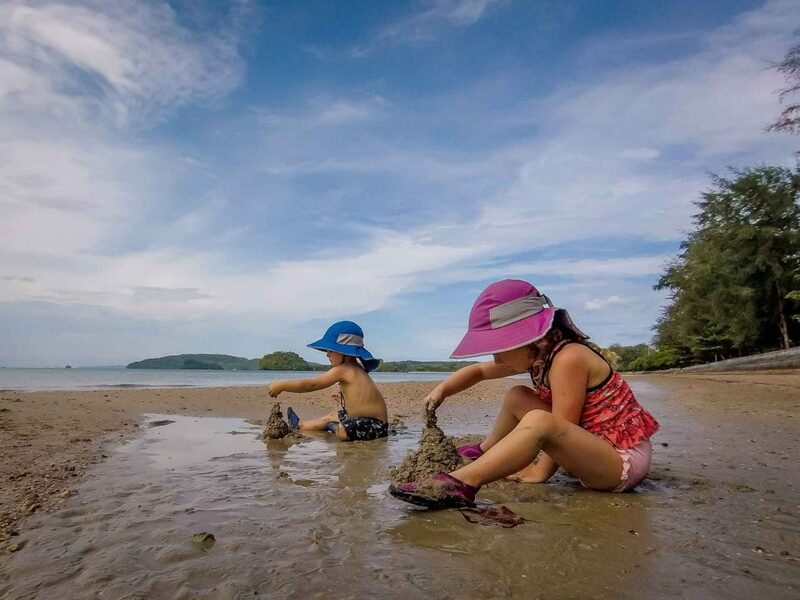 After two weeks of temples, temples and more temples in the north, we knew we’d be ready for a Thailand beach holiday with kids. 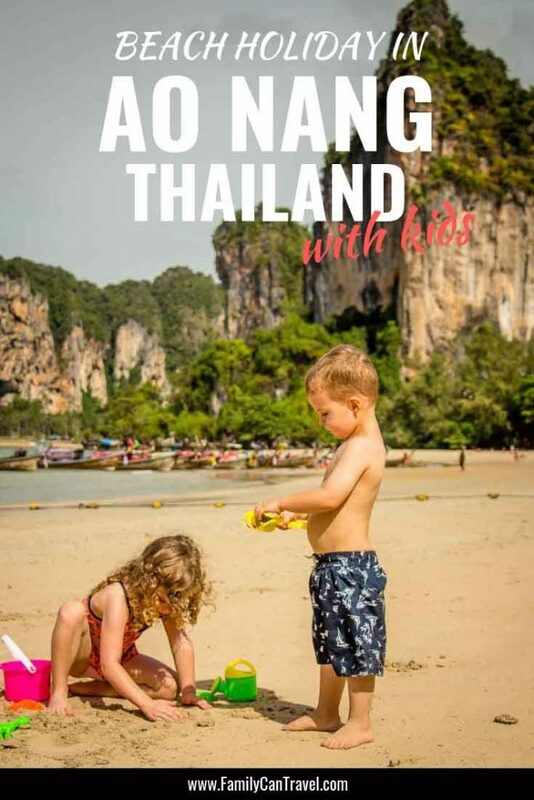 It was hard to choose from the long list of amazing Thailand beach destinations with kids, but we ultimately chose Ao Nang for its incredible scenery. Dramatic limestone karst mountains tower overhead everywhere you look, both on land and sea; it’s really an incredible setting. 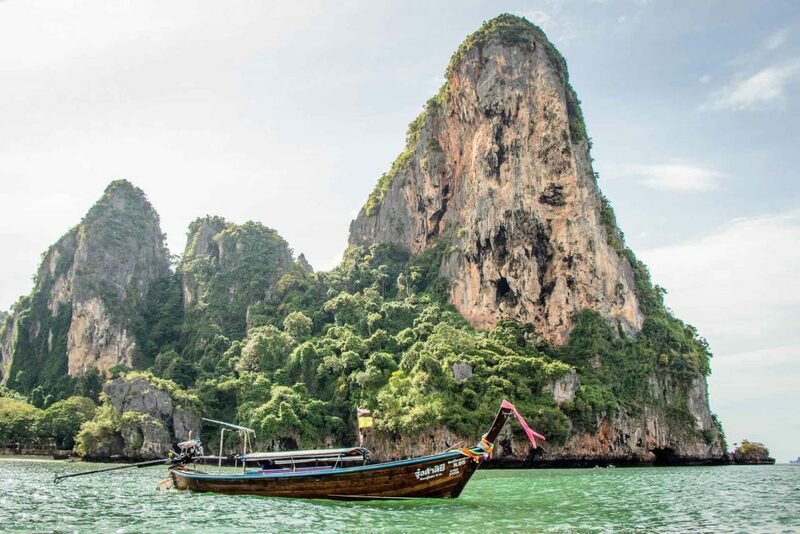 Ao Nang does not have its own airport nor a train station, so it takes a bit of effort to get there, but we think it’s worth it! 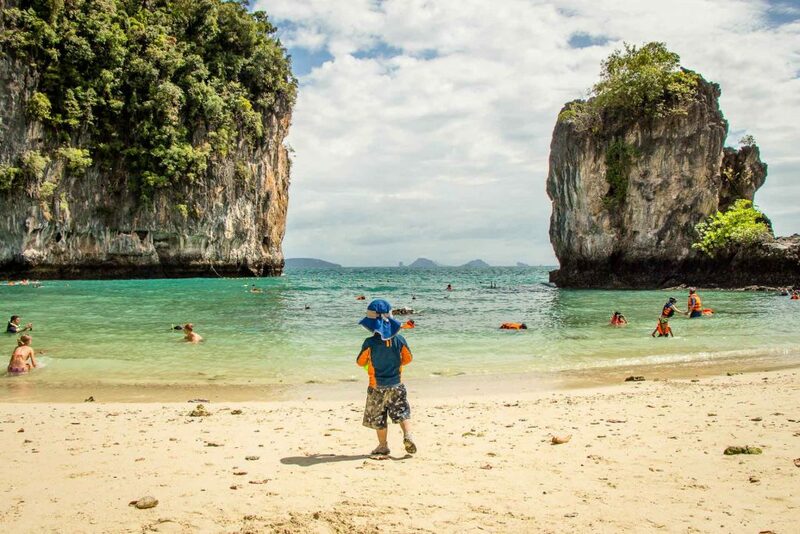 Flights to Krabi: The closest airport to Ao Nang is in Krabi, which is a 30 minute drive away. From Krabi you can hire a driver or take the airport bus (which runs approximately once per hour) to the Ao Nanh hotel zones. Domestic flights to Krabi are very reasonably priced. Ferry to Ao Nang: Ao Nang has its own ferry terminal, which makes it convenient to get here from Phuket or many of the islands in-between. 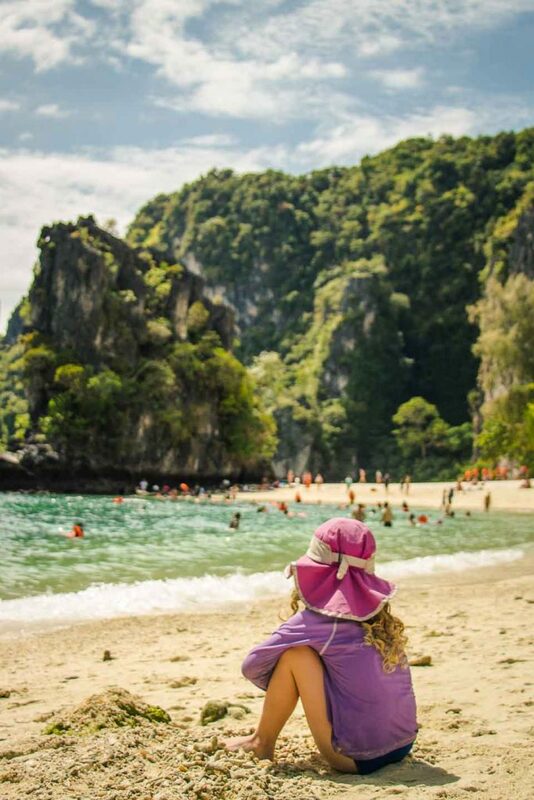 We recommend you use 12go.asia to research and book your travel plans to Ao Nang. 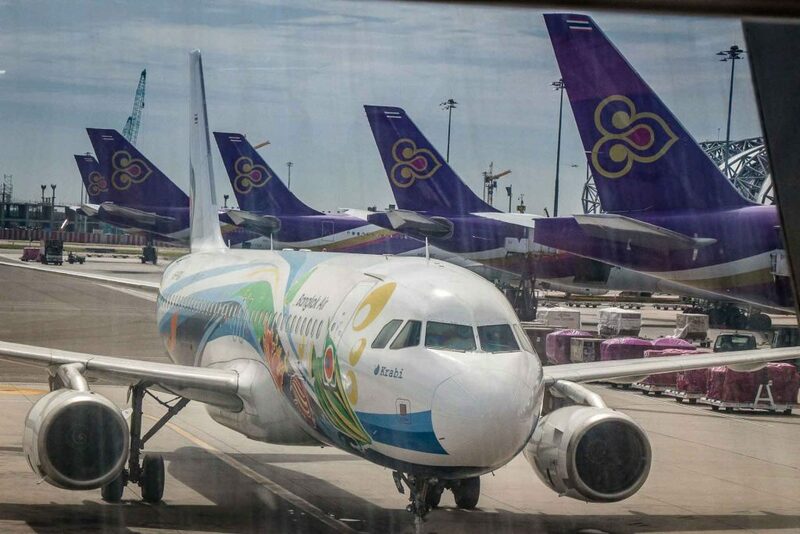 We used 12go.asia several times during our time in Thailand as they make it easy to see all your options in one place, from flights to ferries to taxis. This morning the kids woke up at 6am and despite our efforts to get them to go back to sleep, they were wide awake. So, we went down and enjoyed a nice, large buffet breakfast at our hotel. We were a bit discouraged at the weather forecast which showed mostly clouds and thunderstorms for the duration of our stay. It was drizzling a bit as we were getting dressed for the beach, but we forged ahead with our plans and we were nicely rewarded. Our hotel was on the Noppharat Thara Beach, which is northwest of the main beach in Ao Nang. Due to its location away from the main strip in Ao Nang, Noppharat Thara Beach is less popular than Ao Nang Beach, but that’s just the way we like it. It turned out to be a very family-friendly beach! Noppharat Thara Beach is stunning. Its long stretch of golden brown sand is book-ended by limestone karst mountains on either end. The beach is very clean with hardly any garbage, is home to tons of collectible seashells and has thousands of tiny little crabs and snails. The water is extremely shallow for a very long ways and on the days we were there in December, had non-existent waves (which we understand is typical in the dry season). Our toes hit the sand at 8am and we spent all morning walking from one end of the beach to the other (approximately 3.7 miles / 6km total). We had a ton of fun walking in the shallow water, looking at the fun little crabs and finding seashells for our daughter’s treasure bag. 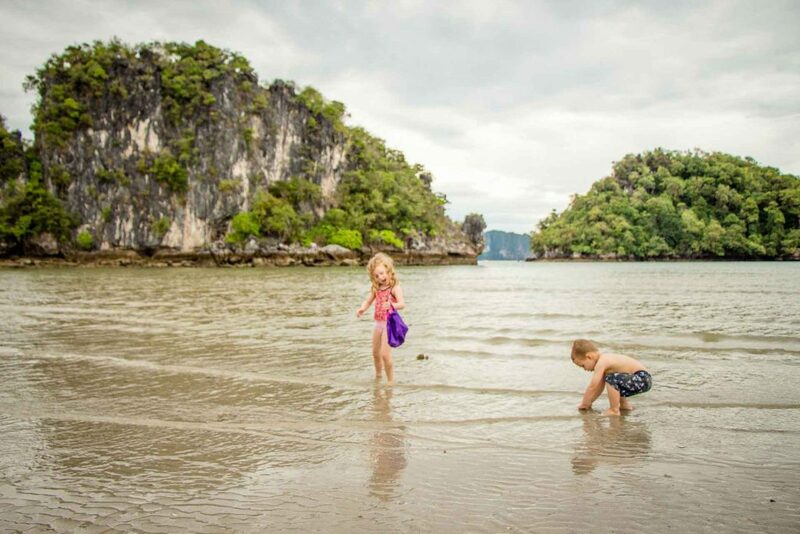 At the northeast end of the beach by the Ao Nang ferry pier are three limestone karst islands. The ones closest to shore can be reached simply by walking through the very shallow water. The middle one is especially fun as you can walk on a very shallow sand bar with small waves splashing into the sandbar walkway from either direction. Despite being in the middle of the high season, the beach felt mostly deserted all morning. It felt like there were more locals on the beach than tourists, which in our mind is a good thing. The sky remained cloudy all morning, with sporadic sun and no rain. Just goes to show you need to just go ahead with your plans, no matter the forecast, as you’ll often be rewarded with a great day. After lunch we let the kids have some quiet time, playing with their toys in their adjoining hotel room. This also gives us a small, yet much needed break from the kids. At these ages, where the kids are a bit challenging behavior-wise, it’s nice for us all to have a little break from each other. Our daughter has recently learned how to swim and has been begging to go to the hotel pool. The weather was getting increasingly cloudy and windy, so we figured it was a perfect time to skip the beach and let her swim in the pool. After breakfast, we set off on foot to go to Ao Nang beach. It was raining when we woke up, but the sky was steadily clearing as we made our way on the short 30 minute walk to the beach. It only took us a few moments to realize that we didn’t like Ao Nang Beach nearly as much as the beach yesterday. It was lined up with a lengthy row of long-tail boats, ready to take tourists to beaches further afield, it smelled really bad due to the large sewer pipe draining on to the beach and there was a noticeable amount of garbage (beer bottle caps, glass, etc.) in the sand. 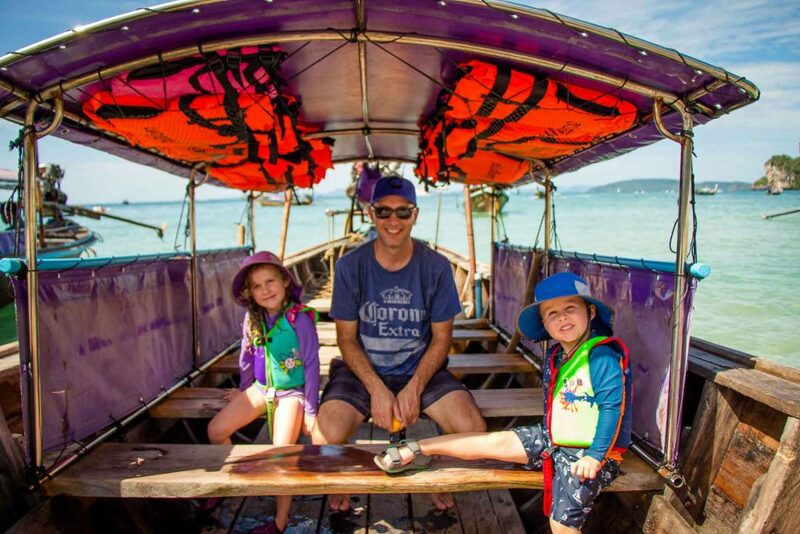 With the sky clearing and becoming sunny, we didn’t want to waste the day at this sub-par beach, so we quickly took a long tail boat to Railay Beach. We weren’t planning on going anywhere today, so I was worried we didn’t have enough baht for the trip, but the kids ended up being free and we only had to pay 400 baht (~$13 USD) for 2 return adult tickets. You buy your tickets at the long-tail boat collective booth and then wait for enough passengers to fill a boat. We ended up being the final people to fill a boat, so we were quickly led to the beach by our captain. Everyone needs to get knee-deep in the water to climb a short ladder into the long-tail boat. Our daughter was able to climb up herself, but we passed our 3 year old from one parent to another. Everyone was given lifejackets, including the kids who were given appropriately sized ones (surprising!). After the captain shuffled the seating arrangement to balance the boat, we were on our way. 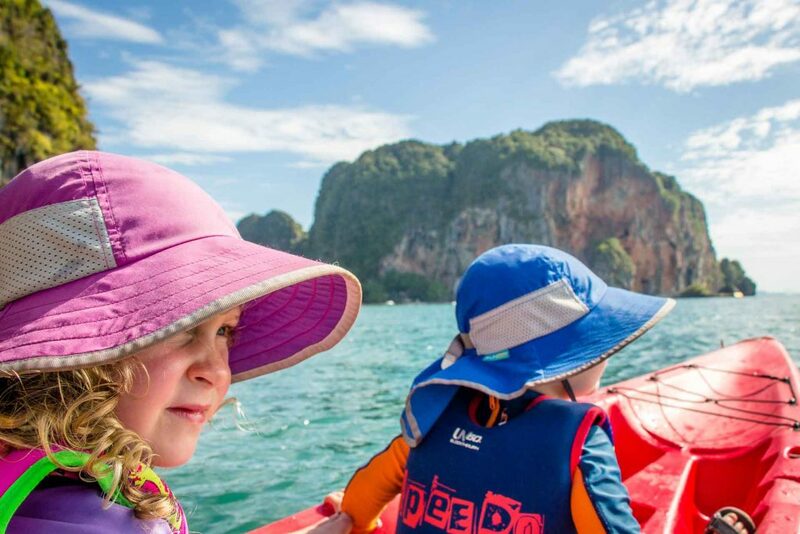 The long-tail boat trip to Railay Beach was quick and very scenic. 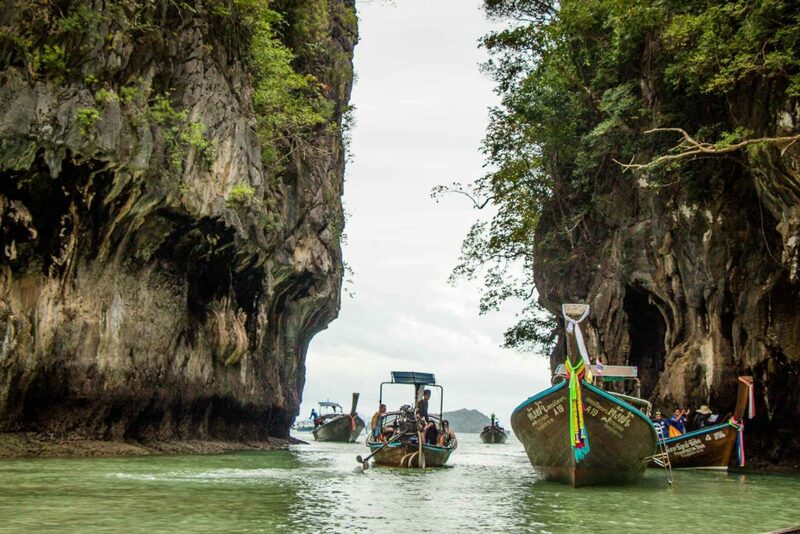 The long-tail boats hug the rugged coastline, dotted with the dramatic limestone mountains the area is famous for. Get your cameras ready, but also be careful to keep them dry as the speed of the boat gets everyone a little wet. 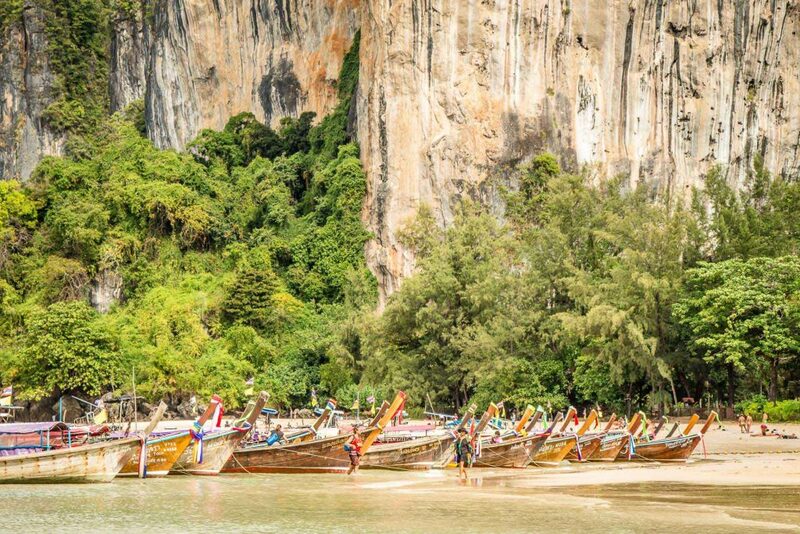 The long-tail boats dock in a big cluster in the center of Railay Beach. Beachgoers who wish to have a stretch of sand without the long-tail boats in front of them can go to either end of the beach where there are large areas roped off to protect people from the boats. 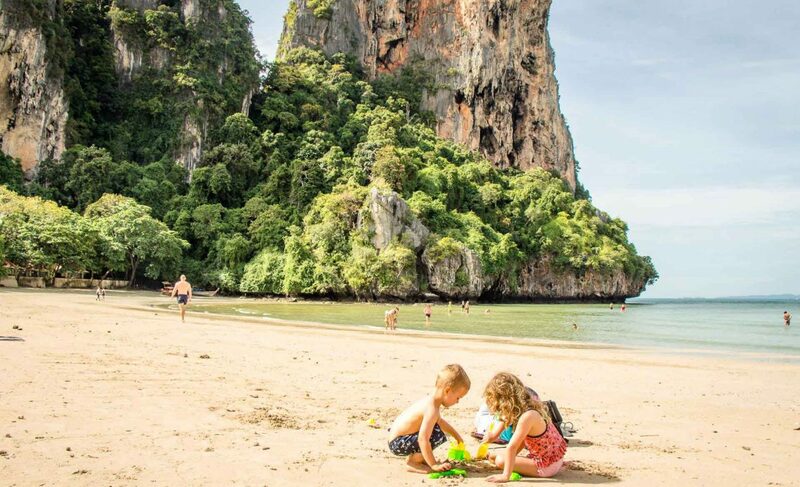 Railay Beach is a truly beautiful beach, with towering limestone mountains on all sides. 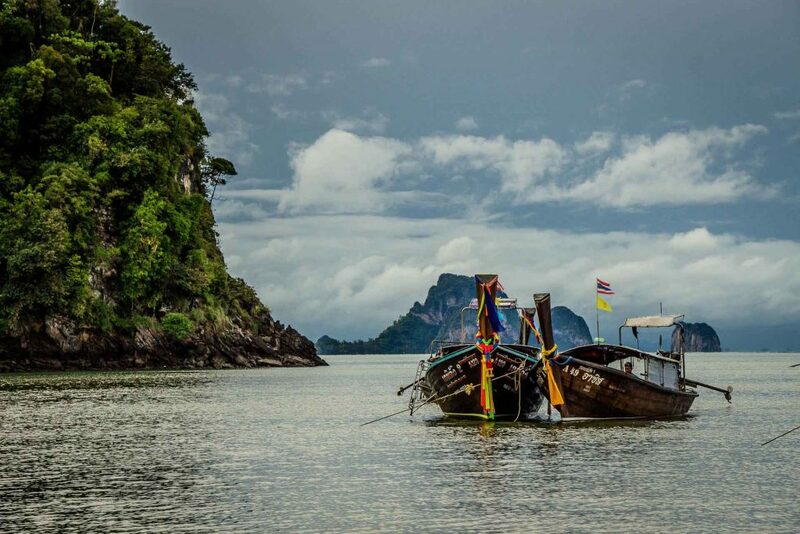 These mountains cut Railay off from the mainland and are the reason it can only be reached by boat. The sand is soft and golden, but due to its popularity, there is little in the way of seashells, etc. left for little kids to collect. It was quite busy given we were there on a sunny day in high-season, but to be honest, it wasn’t that bad and I had expected worse. The ocean stays shallow for a very long time; there are a few rocks on the seafloor, so we kept water shoes on our kids. The water was very tranquil on the day we visited in mid-December with the only real waves coming from the non-stop flow of long-tail boats. Facility-wise, there are a few oceanfront restaurants and a mini-mart in case you need some food or supplies. To get home, bring your return tickets to the area where the long-tail boats are and one of the captains will wave you on to his boat. We had heard that you need to wait for at least 8 passengers for the ride back, but our guy loaded up the four of us and away we went. 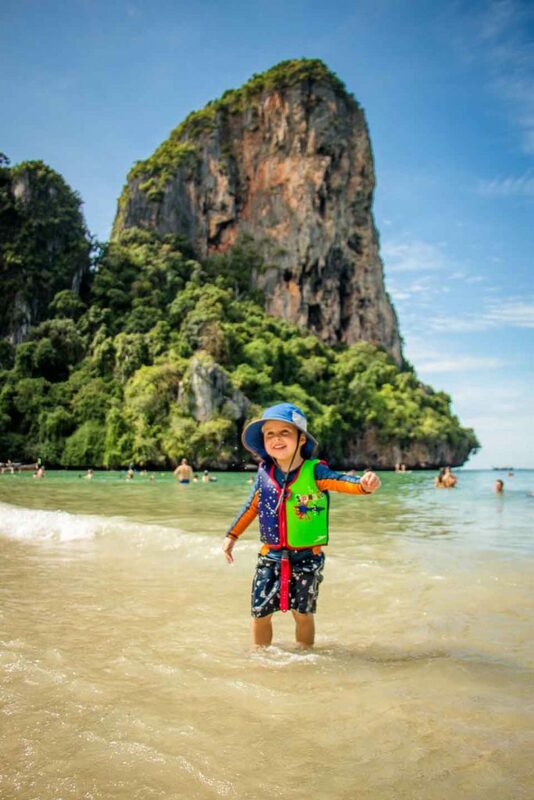 We had a great time at Railay Beach. The scenery was stunning and the kids had a ton of fun playing in the soft sand and in the gentle, warm water. Today we went on a day trip from Ao Nang Beach to Hong Island. In order to take a non-private long-tail boat to Hong Island, a minimum of 5 passengers is required. Even with the steady flow of passengers coming to the collective, we still needed to wait around 30 minutes for more Hong Island passengers to arrive; two nice young ladies from Slovenia. Even then, we were one passenger short, so we pooled our resources and rented a private boat for 2500 baht total (about $20usd each). Wishing we had brought our kids life jackets on this beach excursion! It had rained overnight, so the water was a bit choppy and our captain was a little slow and careful in spots, taking us about one hour to get to the island. When we arrived, our captain expertly guided our long-tail boat through a narrow passage into the beautiful lagoon in the center of the island. The water is very shallow and turquoise green, with tall, lush hills all around. It’s a beautiful spot, only slightly dampened by the boat congestion within. Due to the demand to get in and out, our captain didn’t linger long and we soon left. At first, our captain was hesitant to go to the main beach on the east side of the island as the waves were pretty large. He started to take us to the much smaller beach on the north side of the island, but after talking to other boat drivers he changed his mind and took us to the main beach. The long-tail boats cannot park at the main beach, so they drop you off on a dock at the end of a long, floating pier. Be sure to note your boat number and agree with your captain what time he will pick you up at. There are National Park employees at the dock who collect your 300 baht (~$10usd) payment for admission into the park (our kids were free). After paying the national park fee, you walk along a long, floating pathway from the dock to the beach. This walk can be quite a challenge if the waves are big (as they were when we visited) as the pathway will rise and fall along with the waves. There are ropes on either side to help you balance, but watch your kids closely! There is a stretch of sand immediately north of the floating pathway where you can swim, but most people walk to the very north end of the beach where a small lagoon resides. This beautiful area is nicely protected from the open ocean and has calm water. Swimmers are encouraged via signs and (somewhat annoying) loudspeakers to wear their lifejackets while in the water, although no explanation is given why. There is a decent amount of dead coral chunks and seashells in the shallow water, so bring water shoes. 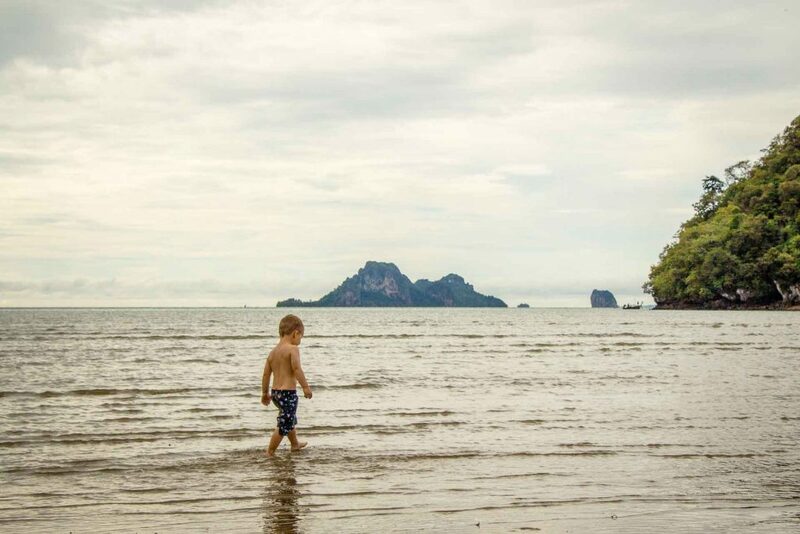 We were at Railay Beach yesterday, which is supposed to be one of the most beautiful beaches in Thailand, but we felt this beach was more beautiful. The beach at Hong Island has true white sand, which produces a beautiful turquoise blue water in the lagoon when the sun is out (Railay’s sand is nice, but it’s golden, not white). The sand here is so soft, it’s like talcum powder (although it sticks to your skin like crazy). Both beaches have towering limestone mountains around them, but Hong Island’s are closer and feel more imposing. We spent a few hours playing on the beach and in the water. We barely got a break from the hot, hot Thailand sun for the first few hours, so we had to reapply sunscreen often (and even then we all got a little burned!). After a while, our son looked like he needed a break from the heat, so we moved to a spot further north in the deep shade under a large tree. 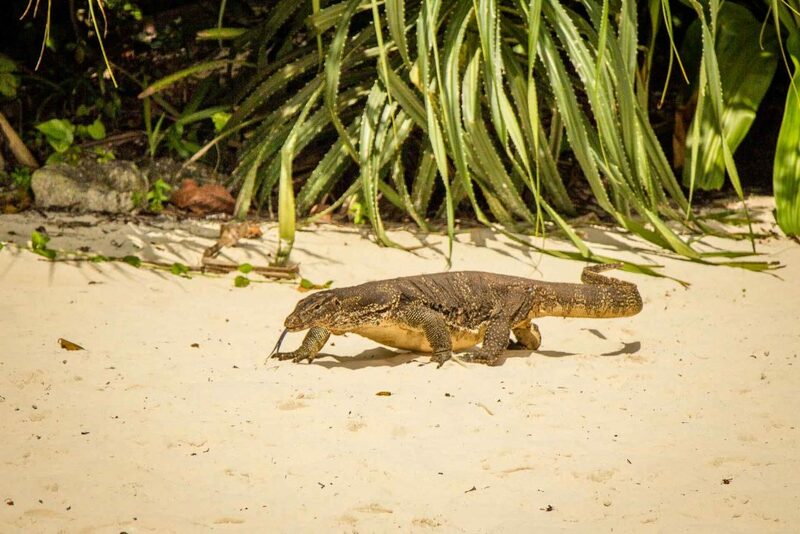 On our way, we passed a large water monitor lizard going for a slow walk along the beach. When he got mobbed by the tourist paparazzi, he ducked back into the jungle. In the shade we drank lots of water and ate many bananas. There is a very small snack shop on the island, but that’s all, so bring your own food and drink. Once the kids cooled down enough, we put on our shoes and went for a walk on the island’s nature trail. There are a lot of good English interpretive signs along the trail, including some interesting ones about the events on the island after the December 26, 2004 tsunami. We felt a few raindrops as we neared the end of the hike and by the time we finished, it was a full-on thunderstorm! There are enough buildings on the island that all the beachgoers were able to seek shelter. The rain was fierce, the wind was strong and the thunder loud. The staff all said not to worry, that it wouldn’t last long, and they were right; after about 20 minutes or so, the storm had passed. We had agreed with our captain that we’d meet at the dock at 3PM. By the time the storm ended, it was time to go. The ocean had calmed down during the early afternoon sunshine, but after this intense storm, the waves were quite high again. The boat was rocking up and down fiercely at the dock making boarding a dangerous challenge, but the national park staff were a big help getting the kids on board safely. The hour-long ride back was white-knuckle tense. The waves were very high and our little long-tail boat was getting tossed around. The boat seemed very strong and I never thought it would fail and sink, but there were a few times that the boat came crashing down so hard after crossing a large wave that we’d all look at each other nervously. How did our kids handle this stressful boat ride home? They slept… Yup – both of them crashed almost immediately after departure. The combination of playing on the beach for hours, coupled with the motion of the boat must have been too much for them. We’re grateful they slept as they didn’t see the concerned looks on our faces. But, our capable driver got us all back to the beach safe and sound, and he left like it was no big deal – just another day at the office. Despite the rough ride home, I’m glad we took our kids to Hong Island. You can’t stay at home all the time on the off-chance something bad happens. Through these experiences, our kids are learning about adversity and how to react in stressful situations; both of which will serve them well as they grow. This morning the plan was to take a long-tail boat to back to Railay Beach to do some kayaking, but it was cloudy and raining when we woke up. After breakfast, a quick check of the forecast showed a risk of thundershowers in the afternoon and given our experience yesterday, none of us had the appetite to risk another boat trip after a storm. So, we delayed our kayak trip to Railay Beach by a day and spent the day at our own beach, Noppharat Thara Beach. This time we found a spot we liked, plunked down our towel and stayed there the whole morning. This beach is so great for kids; tons of seashells to look at, very shallow water that goes out forever, a very sandy ocean bottom (no water shoes required) and tranquil, small (if any) waves. By this time, the clouds had mostly cleared and the sun was out in full force. We spent a little time on the beach playing in the sand, but we spent the majority of the time in the warm water just playing around. The kids loved seeing how far they could go out and still be able to touch. The beach wasn’t very busy, allowing us to leave our bags on the beach (with cameras, etc. inside) while all four of us played. 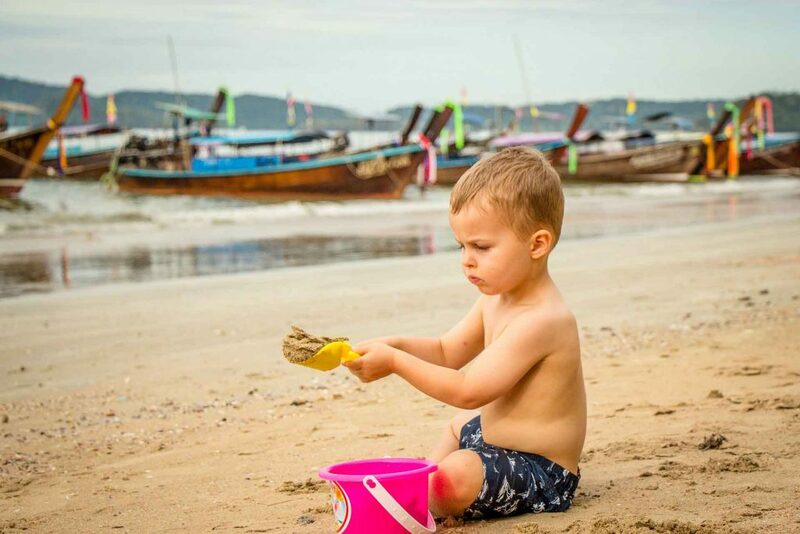 Most of us ended up getting sunburned, so learn from our mistakes and be extra diligent with reapplying sunscreen, especially after playing in the water. We had Pad Thai and fruit smoothies from a local food market for lunch by the hotel pool. The kids played on the trampoline for a while, then in the pool. It was then we noticed our daughters face was really red and the cold pool did nothing to turn it back to normal, so we became concerned she was sunburned. We took her up to our room, where she and her brother stayed for the rest of the afternoon, out of the powerful Thailand sun. Celine and I took turns going for hour-long walks on the beach, enjoying the sun, the scenery and a little precious alone time. Today we went back to Railay Beach for some kayaking. This time the long-tail boat ride was much smoother than our ride back from Hong Island, which was a huge relief for us all. 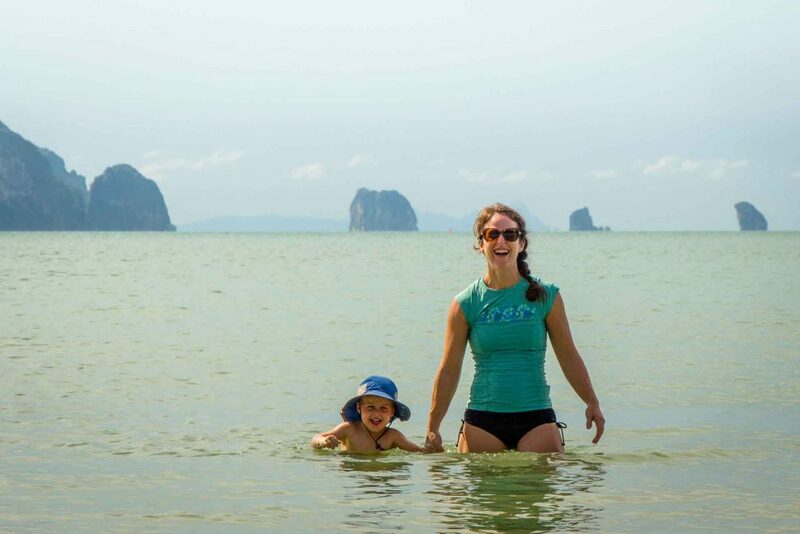 The first time we came to Railay Beach, we promised ourselves we’d come back and kayak these gentle waters and see some of the amazing limestone karst islands up close. So, once we arrived at Railay Beach we promptly rented a 3-seater kayak and were on our way shortly. 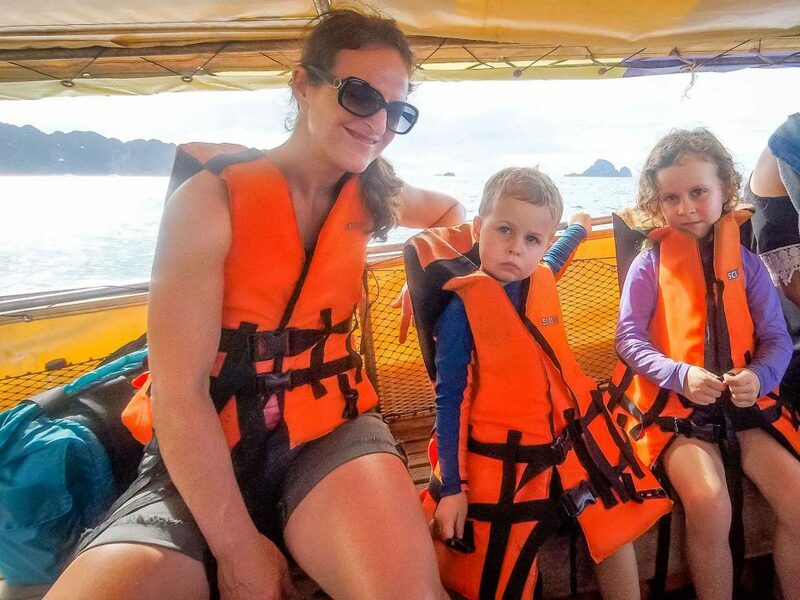 We find most places don’t have small enough lifejackets for our kids, so knowing we’d be doing some watersports in Thailand, we brought our own from home. Our kids shared the front seat of the kayak for a little while, but inevitably they started wrestling, so our daughter got moved back to be in front of Celine in the middle seat. The surrounding water was so tranquil, it made kayaking Railay Beach really easy. The only thing which interrupts this tranquility are the waves from the long-tail boats which seem to go past every few minutes, but the waves from these boats aren’t very big and go away pretty fast. We began kayaking along the southern end of the beach alongside the bottom of a towering limestone cliff. The beauty of these limestone mountains is clear from a distance, but the small details you get up close are special. Dramatic stalactites dangle above the water, while many birds and interesting plants call these rocks home. We soon left the mainland and kayaked out to the two beautiful islands just offshore. There is a small gap between the two which was fun to glide through. Once on the other side, we explored the outer edge of both islands before splitting the gap once more on our way back to shore. 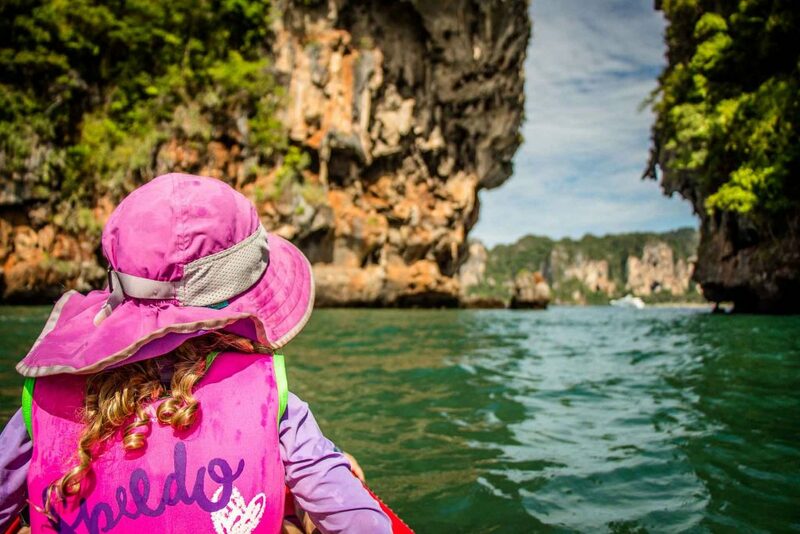 We only rented the kayaks for an hour as we were leaving Ao Nang for Phuket later in the day, but we packed a ton of amazing scenery into our short trip. We rewarded the kids for being so good on the kayaks with more time playing in the warm tub-like water. Selfishly, we used that time to soak up the world-class scenery one last time. This is one of the nicest beaches for scenery we have seen in all of our travels. The constant flow of noisy long-tail boats in-and-out is the only knock on this beach though. We stayed at the Holiday Inn Express on Noppharat Thara Beach. We really enjoyed our stay at this brand-new family friendly hotel. It’s in a great location on a family-friendly beach and has a good buffet breakfast with lots of good dining options nearby. We rented a “family room”, which turned out to be two adjoining rooms, with a king sized bed in ours and two twin beds in the other. It was nice to be so close to our kids, but still have a door between us. The kids loved playing on the trampoline and in the large pool. We would recommend this beach-front hotel in Ao Nang to anyone. If you’d prefer to stay closer to the action, there are numerous hotels along the main strip to choose from. Not sure about Ao Nang? 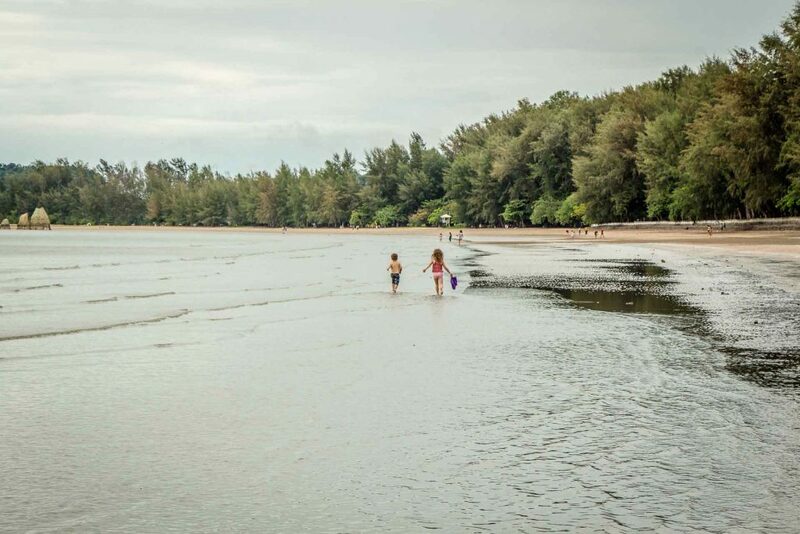 Check out our list of our favorite southern Thailand beaches (COMING SOON). 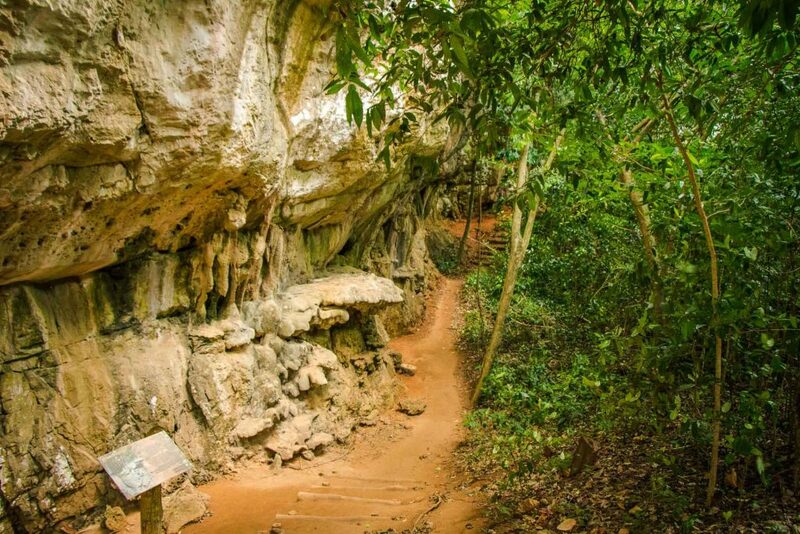 For more Thailand travel ideas, see our posts on our visits to Kanchanaburi, temple hopping in Ayutthaya with kids and 6 days in Chiang Mai with kids.